I’ve been traveling with my family to the Big Island of Hawaii pretty regularly for the last 10 years. Each trip I scoured the countryside exploring for inspiring landscapes bathed in beautiful Hawaiian light in the early hours of the day when my family was still resting at the hotel. I found plenty of moving views, but one sight I hungered to see was molten lava from Kilauea volcano finding its way to edge of the Pacific Ocean at dawn. I chartered a doors-off helicopter shoot a number of years ago and saw steam plumes from one lava-to-ocean entry point, but learned I really couldn’t capture the event the way I wanted from the air. I had to get on the ground, very close, at the decisive moment. I searched for information on when the lava was making entry, where and how to get to the spot, but inevitably, the stars just didn’t ever seem to align during those family trips to the island. Thankfully for me, Bruce and Tom cleared their calendars and spent the next 4 days with me. They picked me up at 3 a.m. every morning except one and we either hiked to the ocean entry point or shot stars over Kilauea crater. I honestly don’t know how I could ever get the lava shots I did without Bruce and Tom’s expert guidance. They know the terrain and have intimate understanding of the nature of lava. They know what is “safe” and what isn’t. They know what works photographically and what doesn’t. They instill confidence and have a profound appreciation of the subject. 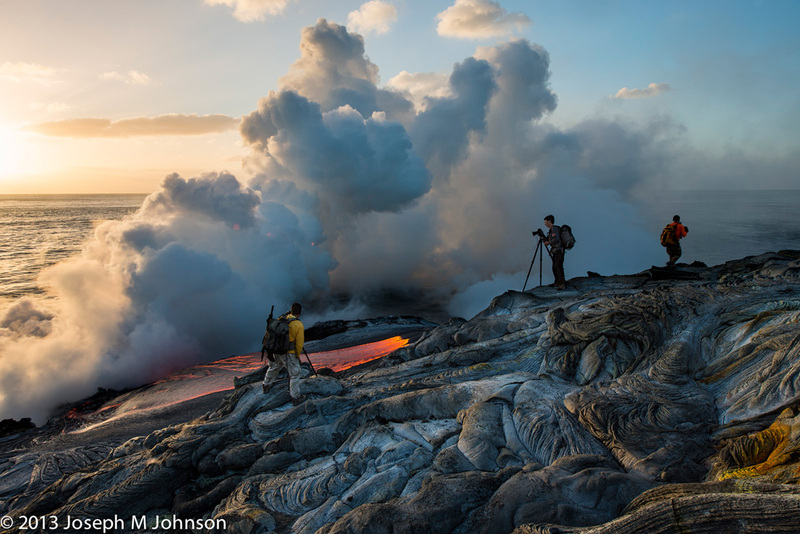 A standard lava tour hike could never come close to delivering the experience I had shooting with Bruce and Tom. We arrived at Bruce & Tom’s special (as in legal) parking spot about 4:30 a.m. We donned flashlights and took off over the lumpy lava fields with 40+ pounds of camera gear and liquids. The entry point was about 2.5 miles away, but Stairmaster-like, up-and-down lava hopping made it feel more like 4 miles. Nothing could have prepared me for the absolute awesome spectacle of red-hot lava oozing out in multiple points across a kilometer-wide expanse of brand new terra-“firma” just before diving, dripping, rolling into the Pacific. The exposed molten lava would quickly harden on top, but remained in a red-hot plastic state just inches below the crust. I dropped my jaw when Tom led out across newly crystalized lava rock with red still glowing through the cracks and crevasses in the pre-dawn darkness. The thrill of walking over this infant formation is hard to describe, although one word incessantly pops to mind: HOT! The wind plays a huge role in determining what kind of shot you’ll be able to craft. We found a position to the southeast of an entry point that put the sunrise across the ocean horizon at about 2 o’clock. Fortunately, the breeze was blowing the plume seaward and gave us plenty of opportunity to see the lava hitting the water unobscured by steam. Light cloud formations added to the mood and that first morning of shooting could hardly have been more perfect. The subsequent morning was only a touch less spectacular. The red lava posed wickedly beautiful with its snow-white mane ever changing against the constantly shifting dawn backdrop; she made the perfect model. Perfect for portraits. Perfect for landscapes. Perfect close-ups. Technically, the shoot was about as challenging as it gets. The red-hot lava glows hottest in the dark before dawn and is its own light source, but detail in the surrounding black rock formations won’t show well until sunrise. Likewise, it’s practically impossible to hold detail in the white steam and waves without completely blocking up the shadows of the black lava rock and sand. Slow shutter speeds yield nicely blurred lava flow, wave and steam, so after sunrise it is good to have some neutral density filters on hand. Again, Bruce and Tom are the experts and I gladly soaked up any and all suggestions. You find yourself standing on some pretty hot spots, so you have to either keep your camera bag on your back or find a safe place to lay it down; we melted two umbrellas on the first day. When the steam plume drifts overhead, you and your equipment get rained on with diluted hydrochloric acid. When that happens, it’s best to cover your gear and quickly move away. Steady tripods are a must. RRS Rock Claw tripod feet are a must. Sturdy hiking boots, full-length pants and long sleeve shirts are a must. Hat and sunscreen are recommended. 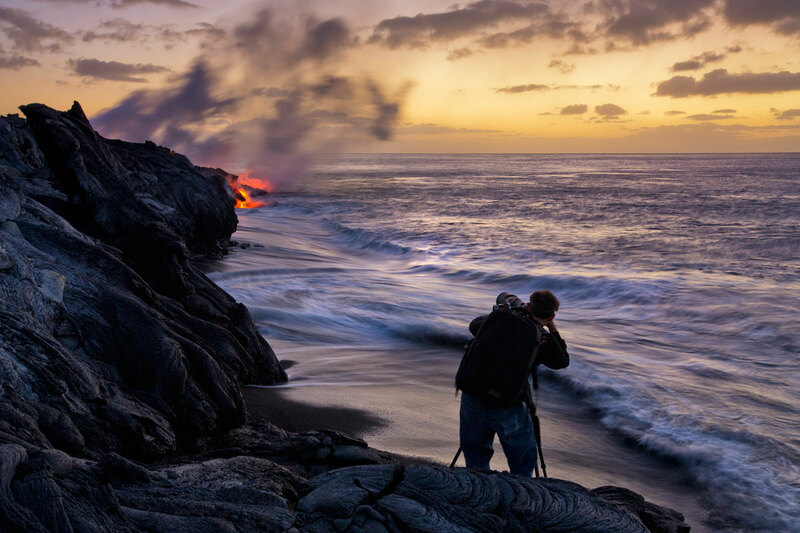 As fantastic as shooting the lava is, the rest of the Big Island is too fantastic to ignore. I’m not going to go into detail here because I covered the topic in September 2011. Suffice it to say that Bruce and Tom are life-long residents of the Big Island and know some incredible vantage points for photography of all types. 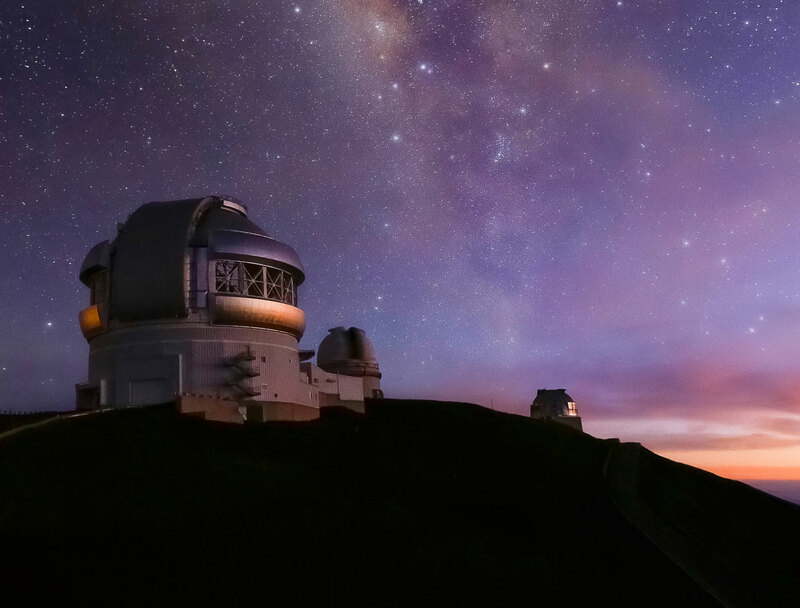 We shot stars over Kilauea crater, the surf at Waipio Valley, sunset overlooking the Northeast coast, forest undergrowth on Kohala Mountain and street photos in Hilo. Again, I can’t thank enough my good friends, Bruce Omori and Tom Kuali‘i. They both have hearts of gold and I can’t think of two better people to enjoy a photographic adventure of a lifetime with. The lava is fickle, so here’s my key recommendation for those who have the wherewithal and inclination: do not delay. 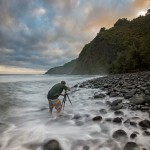 Call ExtremeExposure.com and book a half-day, full-day or multi-day Big Island photo adventure. Nice, great fun and thanks for the lead! Been to Maui but not the Big Island. Adding lava and extremexposure.com to my list. Bruce and Tom are great guys and amazing photogs. I can’t say enough good things about them. Jealous of the shots you captured. Pele was taking a nap when I was out last. Wonderful article. So glad you had this experience. It’s pretty hard to describe and you did a great job. Just hope you have a mask or something to wear in case the sulfur clouds start turning your way. had my first trip to Hawaii last September, loved it! The “Big” island is unbelievable. Thanks for sharing and adding something else to my list! I was just out on the lava fed onMonday night and it was awesome. Truly a one of a kind experience. What a fantastic writeup!! I’ve had the privilege of booking a photo tour with Extreme Exposure, and it was one of the absolute highlights of my life. Bruce and Tom are the ultimate professionals, world-class shooters, and most importantly, just wonderful guys. Bruce has been raving about those RRS Rock Claw Tripod Feet on his new RRS Tripod! Incredible!! 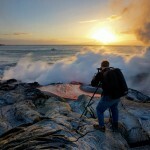 I’m glad you finally got to photograph the lava flowing into the pacific. Thanks for sharing your adventure. I now have to add one more thing to my Photography Bucket List. Great story and images! I makes me rethink the ease of showing up slightly planned and coming away with good imagery. 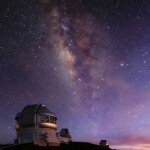 Nice read, I could only dream of going to some place like that, you have some great shots. Maybe one day I will do a tour. Beautiful shots, thanks for sharing them. Really like the texture in the hardened lava, and love those shorts in that shot at Waipio beach. 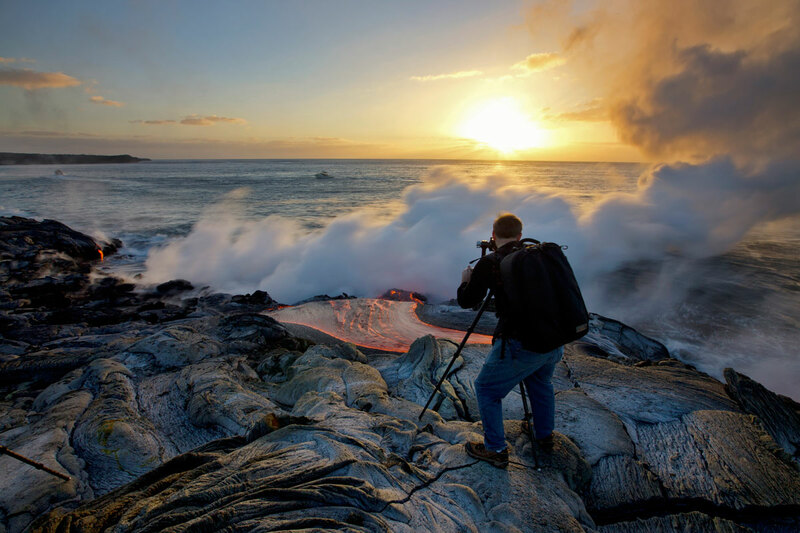 Bruce and Tom have great lava work but if they are “undoubtedly the foremost lava photographers in the world”, how come their portfolio doesn’t even show a single image of Puu Oo which is the center of the eruption – and therefore no lava lakes, spatter, nor fountains ? I was really happy with my purchases from Really Right Stuff prior to my trip to shoot with Tom and Bruce on the big island. 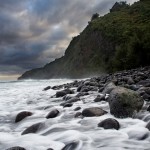 We purchased the rock claws after reading this post and they were MONEY when we set up to shoot the surface lava flows. One of our group melted his rubber tripod feet. I have to say that my MH-55 ball head and RRS tripod with rock claws were rock steady no matter what I have saddled onto it. What an amazing week we had shooting on the big island. 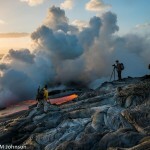 Shooting with Tom and Bruce from Extreme Exposure was key to us getting awesome lava shots. We chose to shoot for two days with them and without a doubt they are top notch in their field, so I would recommend them to any serious shooter visiting the island. They totally know the island and its people so they have access to the hot places to shoot. They are professional photographers who know how to shoot the island and their portfolios are AMAZING. We felt very safe shooting in a dangerous environment because we were with two of the best lava photographers on the planet. I loved our trip and can safely say that we made two good friends on the big island and hope that we can return to shoot again with such fine professionals. Mahalo Bruce and Tom! 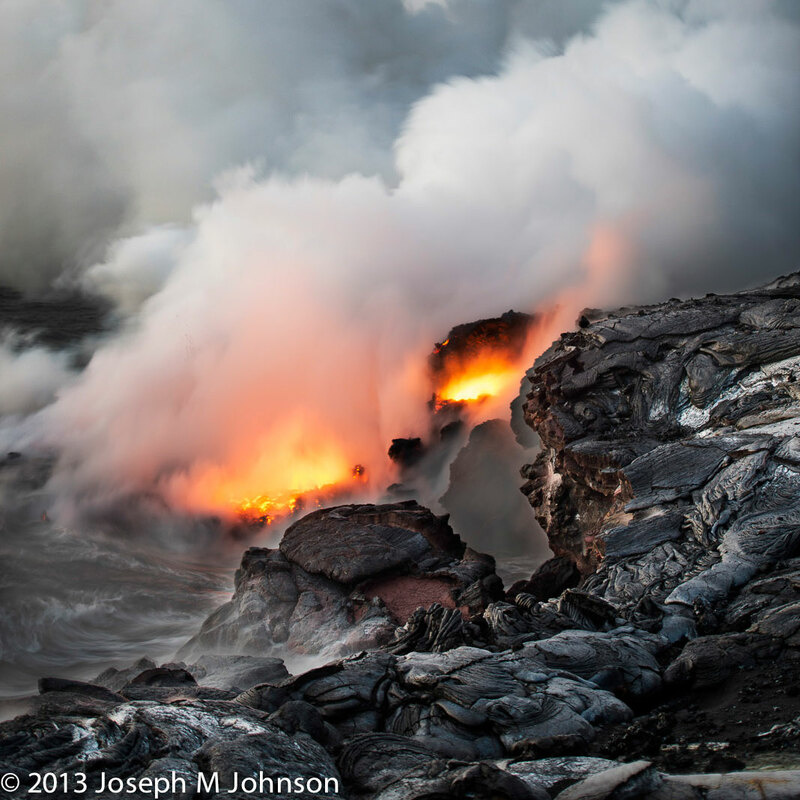 Lava Flow really gives the thrilling experience.Awesome lava pictures. Great pics. I love it. Lava Flow really gives the thrilling experience. A great place to visit in this world. Such a wonderful place. Will surely visit once. Thank you for sharing this informative article. Great Blog with Excellent post.